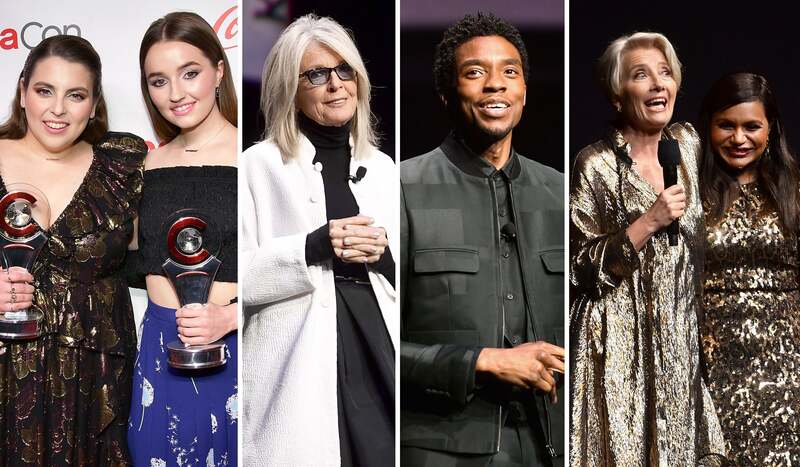 A parade of actors and directors of different colors, genders, and ethnicities took the stage at this year's CinemaCon to add variety and glamour as studio executives promoted their upcoming releases to theater owners. At the annual convention of NATO (National Association of Theater Owners) which was held April 1 to 4 in Las Vegas, Diane Keaton, introduced Poms, a comedy about cheerleaders in a retirement home from STX, playfully lifting her billowy black skirt over white boots to prove how her skinny legs prevented her from cheerleading in high school. Chadwick Boseman, king of the African country of Wakanda in Black Panther, who plays an NYPD detective in 21 Bridges, said he chose this script because “It took me back to my theater days when you had the fast-paced language of David Mamet.” As a producer on the film, Boseman cast as his antagonist Stephan James of If Beale Street Could Talk. 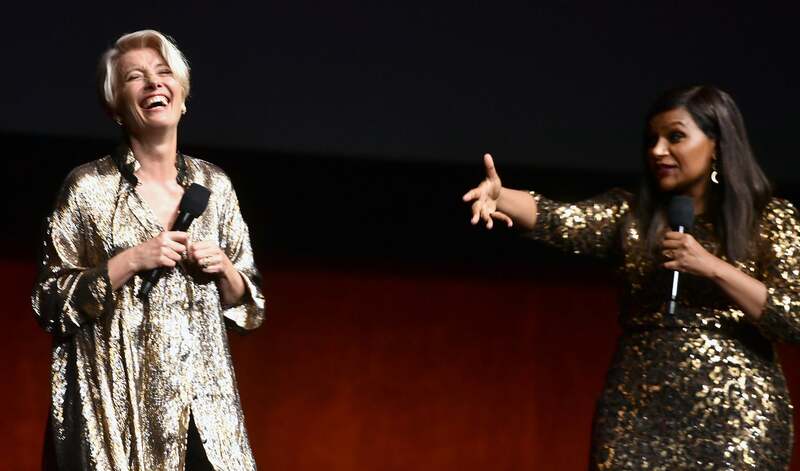 Emma Thompson, starring as a celebrated TV talk show host in Amazon’s Late Night directed by Nisha Ganatra from a script by Mindy Kaling, recalled the first time she went to the theater, to see the animated classic Fantasia, as a spiritual experience. Creator and star of the TV series The Mindy Project, Kaling, whose parents are from India, also plays a diversity hire in Late Night's all-male writing room, and the slowly building friendship between the two women from vastly different backgrounds is the heart of this comedy. Tiffany Haddish, who came onstage with fellow comedian Melissa McCarthy to promote the crime drama The Kitchen (New Line-WB) by Andrea Berloff, joked, "There are so many layers to women, we’re like onions! We make you cry; we make you laugh, we are delicious, and we can kill you!” The film’s plot, reminiscent of Widows by Steve McQueen, is about the wives of top New York gangsters who continue to operate the family business while their husbands are in jail. Daniel Kaluuya stars in Queen & Slim (Universal) directed by Melina Matsoukas from a script by Lena Waithe. The Golden Globe-nominated actor talked about the importance of under-represented voices in movies. Waithe, creator of the TV series The Chi, called her film “protest art.” Octavia Spencer presented the horror movie Ma (Universal), where she plays the scary lead, with director Tate Taylor (The Help). Receiving the Spotlight award, she was more emotional than when she won a Golden Globe and an Oscar as a producer of Green Book. She confesses that she was so poor growing up that it was a luxury for her to go to the movie theater. Olivia Wilde, receiving the Breakthrough Director of the year for Booksmart (Annapurna), said: “The only thing better than being an actor is being a director, and to be able to achieve these dreams I’ve had since I was a kid.” Kaitlyn Dever and Beanie Feldstein, the two young stars of the film who play best friends in high school, shared the Female Star of Tomorrow award. Feldstein says: "I was inspired by seeing women be funny together on the big screen in Bridesmaids."